About Parents Plus Research from Parents Plus on Vimeo. The Parents Plus Programmes are evidence-based interventions and currently over 20 studies conducted in clinical, community and disability settings attest to their effectiveness for families with children and adolescents of all ages, and for separated families. The programmes follow international best-practice guidelines as described by the National Institute for Clinical Excellence in the UK, and they are specifically listed as evidence-based programmes by the Department of Education (UK) – www.education.gov.uk. 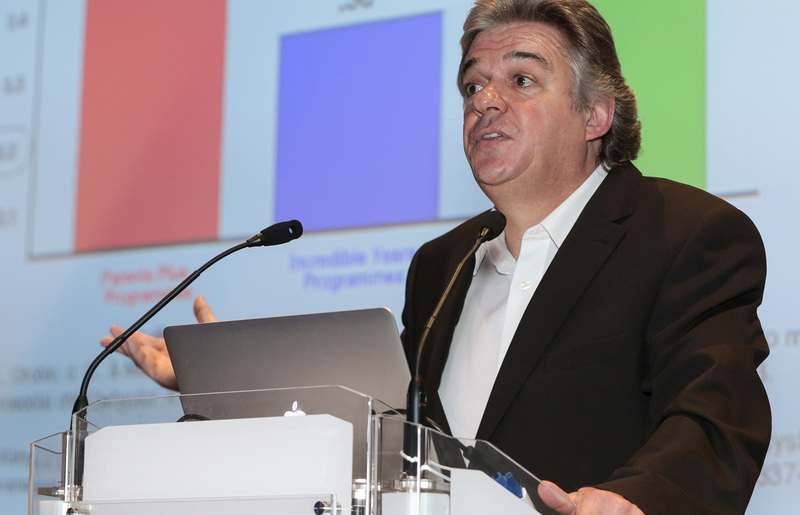 In December 2015, Prof. Alan Carr, University College Dublin, presented a meta-analysis of the Parents Plus evidence base. This analysis highlighted the significant benefit for families who attend the Parents Plus courses, both post-treatment and importantly, at follow-up. The study (Carr, Hartnett, Brosnan & Sharry, 2016) was published in the international Journal Family Process. Read more here: A Meta Analysis of the Parents Plus Evidence Base (Presentation by Alan Carr) and here: Full Meta-Analysis Paper, or see the summary below. There’s also a video abstract summarising this paper which you can view here. In addition, the Parents Plus Programmes have been independently evaluated by National Parenting Academy in the UK and were awarded top ratings. Specifically, the Parents Plus Children’s Programme was awarded the highest category rating for the theoretical underpinnings of its approach and its comprehensive programme materials and the second highest category for its facilitator training protocols and evidence base. Significantly, the Academy noted the evidence for the programme as robust and equivalent to the gold standard Randomised Control Trial (RCT). Download the Academy report for more information. Behan, J., Fitzpatrick, C., Sharry, J., Carr, A. & Waldron, B. (2001). Evaluation of the Parents Plus Programme. Irish Journal of Psychology, 22(3-4), 238-256. Carr, A. (2015). The evidence base for the Parents Plus & Working Things Out programmes. Parents Plus Innovations in Working with Families Conference, Dublin, Ireland, 3rd December 2015. Carr, A., Hartnett, D., Brosnan, E. & Sharry, J. (2016). Parents Plus systemic, solution-focused parent training programs: Description, review of the evidence base, and meta-analysis. Family Process. Coughlin, M., Sharry, J., Fitzpatrick, C., Guerin, S. & Drumm, M. (2009). A controlled clinical evaluation of the Parents Plus Children’s Programme: A video-based programme for parents of children with behavioural and developmental problems. Clinical Child Psychology and Psychiatry, 14(4) 541–558. Fitzpatrick, C., Beattie, D., O’Donohoe, P. & Guerin, S. (2007). Parent management training for adolescent mental health disorders – A controlled trial. 54th Annual Meeting of the American Academy of Child & Adolescent Psychiatry, Boston, MA, USA. 23-28th Oct 2007. Gerber, S, Streek, A., & Mc Kenna, G. (2013). A Rising Tide? The potential and possibilities arising from community-based parent support. Early Childhood Ireland: Global Gathering for Early Childhood 2013, 17th October 2013, Dublin, Ireland. Gerber, S., Sharry, J., Streek, A., & McKenna, G. (2016). Parent training: Effectiveness of the Parents Plus Early Years Programme in community preschool settings. European Early Childhood Education Research Journal, 24(5). Griffin, C., Guerin, S., Drumm, M. & Sharry, J. (2005). Evidence-based practice in parent training: the search for sound evidence of effectiveness. The Irish Psychologist, 31(7) 196-200. Griffin, C. (2006). 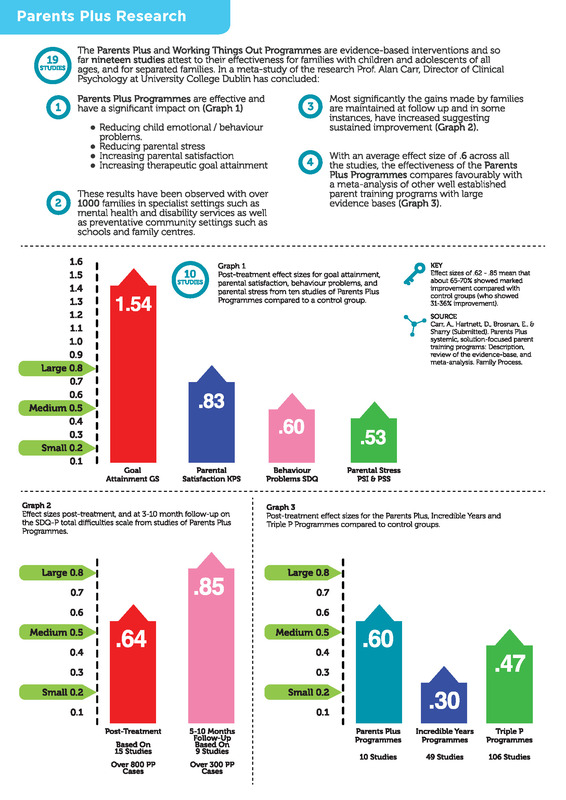 A clinic-based evaluation of the Parents Plus Early Years Programme. Department of Psychology. University College Dublin: 242. Griffin, C., Sharry, J , Guerin, S. & Drumm, M. (2006). I am not alone: The importance of the group in parent training. Eisteach: Journal of Irish Association of Counselling and Therapy, 6(2). Griffin, C., Guerin, S., Sharry, J. & Drumm, M. (2010). A multicentre controlled study of an early intervention parenting programme for young children with behavioural and developmental difficulties. International Journal of Clinical and Health Psychology 10(2) 279-294. Hand, A., Ní Raghallaigh, C., Cuppage, J., Coyle, S., Sharry, J. (2012). A controlled clinical evaluation of the Parents Plus Children’s Programme for parents of children aged 6–12 with mild intellectual disability in a school setting. Clinical Child Psychology and Psychiatry, 18(4) 536–555. Hand, A. McDonnell, E., Honari, B. & Sharry, J. (2013). A community-led approach to delivery of the Parents Plus Children’s Programme for the parents of children aged 6-11. International Journal of Clinical and Health Psychology, 13, 81-90. Hayes, N., Siraj-Blatchford, I., Keegan, S. and Goulding, E. (2013). Evaluation of the Early Years Programme of the Childhood Development Initiative. Dublin: Childhood Development Initiative (CDI). Keating, A., Sharry, J., Murphy, M., Rooney, B. & Carr, A. (2016). An evaluation of the Parents Plus – Parenting When Separated programme. Clinical Child Psychology and Psychiatry, 21(2) 240–254. Kilroy, S., Sharry, J., Flood, C. & Guerin, S. (2008). Parent training in the community – a pilot study. Paper presented at Association of Child Psychology and Psychiatry Research Conference, September 2008. Kilroy, S., Sharry, J., Flood, C. & Guerin, S. (2011). Parent training in the community: Linking process to outcome. Clinical Child Psychology and Psychiatry 16(3) 459–473. Lonergan, A., Gerber, S., Streek, A. & Sharry, J. (2015). Parenting groups, how long is enough? The efficacy of a community-run Parents Plus Early Years Program as a preschool parenting intervention of modifiable duration. Global Journal of Community Psychology Practice, 6(1) 1-13. Nitsch, E. (2011). Positive Parenting: A Randomized Controlled Trial Evaluation of the Parents Plus Adolescent Programme in Schools. Dept. of Psychology, University of Limerick. Nitsch, E., Hannon, G., Rickard, E., Houghton, S. & Sharry, J. (2015). Positive parenting: A randomised controlled trial evaluation of the Parents Plus Adolescent Programme in schools. Child and Adolescent Psychiatry and Mental Health, 9:43. Sharry, J., Guerin, S., Griffin, C. & Drumm, M. (2005). An Evaluation of the Parents Plus Early Years Programme: A video-based early intervention for parents of preschool children with behavioural and developmental difficulties. Clinical Child Psychology and Psychiatry 10(3) 319-336. Quinn, M., Carr, A., Carroll, L. & O’Sullivan, D. (2006). An evaluation of the Parents Plus Programme for pre-school children with conduct problems: A comparison of those with and without developmental disabilities. The Irish Journal of Psychology, 27(3-4) 168-182. Quinn, M., Carr, A., Carroll, L. & O’Sullivan, D. (2007). Parents Plus Programme I: Evaluation of its effectiveness for pre-school children with developmental disabilities and behavioural problems. Journal of Applied Research in Intellectual Disabilities, 20(4) 345–359. Rickard, E. D., Brosnan, E., O’Laoide, A., Wynne, C., Keane, M., McCormack, M. & Sharry, J. (2015). A first-level evaluation of a school-based family programme for adolescent social, emotional and behavioural difficulties. Clinical Child Psychology and Psychiatry. Wynne, C., Doyle, C., Kenny, R., Brosnan, E. & Sharry, J. (2016). A first-level evaluation of a family intervention for adolescent social, emotional and behavioural difficulties in Child and Adolescent Mental Health Services. Journal of Child and Adolescent Mental Health, 28(1) 33-46. Sixty-seven adolescents attending child and adolescent mental health services were randomly allocated to the Working Things Out CBT based group programme or to ‘treatment as usual’. Standardised measures were completed pre- and post-intervention, and at three-month follow-up. Adolescents who completed the Working Things Out programme had a significant reduction in their emotional and behavioural difficulties, and used significantly more ‘good’ coping strategies three months following completion of the programme. Those who received treatment as usual also improved, but their coping strategies failed to improve significantly. The study has been submitted as a PhD thesis in UCD (Brosnan, 2015). In an evaluation of the combined delivery of the Parents Plus Adolescent and Working Things Out programmes (PPAPWTO) targeted at adolescents with social, emotional and behavioural difficulties (SEBD), the outcomes of 93 adolescents aged 11–17 years (M = 14.64, SD = 1.31; 39% male) attending Child and Adolescent Mental Health Services (CAMHS) in Ireland, and their parents were analysed. The study used a quasi-experimental One-Group Pre-test-Post-test design to assess change from pre- to post-intervention using the Strengths and Difficulties Questionnaire, the McMaster General Functioning Scale, Goal Attainment, Parent Stress Scale and the Kansas Parenting Satisfaction Scale. Both parent- and adolescent-rated goal attainment and general family functioning improved from pre- to post-intervention. Parents also rated their satisfaction with parenting as having significantly improved. Adolescent-rated emotional difficulties significantly improved for the overall sample and parent-rated child total difficulties for female adolescents significantly improved from pre-test to post-test. Parents of female adolescents also reported a significant drop in parental stress. These findings indicate that the PPAPWTO may be an effective intervention for adolescents with SEBD, particularly females, and their parents. The study was published in the Journal of Child and Adolescent Mental Health (Wynne, Doyle, Kenny, Brosnan & Sharry, 2016). In an evaluation of the combined delivery of the Parents Plus Adolescent and Working Things Out Programmes targeted at adolescents with emotional and behavioural difficulties in Irish post-primary schools, the outcomes of 47 participating parents and their adolescent children (mean age being 13.81 years) were analysed. The study used a repeated-measures design to assess change at pre- and post-intervention and five-month follow-up using the Strengths and Difficulties Questionnaire (parent and adolescent rated), McMaster General Functioning Scale (parent- and adolescent-rated), Parent Stress Scale, and Kansas Parenting Satisfaction Scale as assessment measures. Parent and adolescent rated behavioural difficulties significantly improved from pre- to post-test, as did parents’ stress and their satisfaction with parenting. These gains were largely maintained at five-month follow-up, although parent stress increased from post-test to follow-up. These findings indicate that the combined PPAPWTO programme may be an effective intervention for adolescents with emotional and behavioural difficulties, and their parents. It was also demonstrated that a cost-effective, manualised family intervention could be effectively rolled out in a post-primary school setting, with delivery and evaluation being conducted by school staff. This study has been published by Clinical Child Psychology and Psychiatry (Rickard, Brosnan, O’Laoide, Wynne, Keane, McCormack & Sharry, 2015). In a small scale comparative study, Behan et al. (2001) found that parents who completed the original Parents Plus Programme (for parents of children aged 4-11 years) reported fewer child behaviour problems and improved parent-child interaction post-intervention, when compared to a waiting list control group. In an evaluation of the effectiveness of the programme for preschool children with developmental disabilities and behavioural problems, Quinn, Carr, Carroll and O’Sullivan (2006) found that the children of parents in the treatment group (n = 22) showed better adjustment on the total difficulties scale of the Strengths and Difficulties Questionnaire than those of participants in the waiting list control group (n = 17). Furthermore, these gains were maintained at 10-month follow-up. This study was published in the Irish Journal of Psychology. Another related study published in the Journal of Applied Research in Intellectual Disabilities (Quinn, Carr, Carroll & O’Sullivan, 2007), showed that the Parents Plus Programme could also be effective for children with behavioural difficulties, with and without developmental disabilities. This study is a first-level evaluation of a family intervention targeted at adolescents with social, emotional and behavioural difficulties (SEBD) attending Child and Adolescent Mental Health Services (CAMHS) in Ireland. It is a combined implementation of the Working Things Out adolescent programme and the Parents Plus Adolescent Programme (WTOPPAP). Using an RCT design, PPAP was evaluated through a programme roll-out in secondary schools in Kerry and Cork in Ireland, involving 109 parents assigned either to a treatment group (n = 70) or a waiting list control group (n = 39). Assessment took place before and immediately after the eight-week intervention for both groups and at six-month follow-up for the PPAP group. Compared to the waiting list group post-programme, the PPAP group displayed significant reductions in total difficulties and conduct problems as measured by the Strengths and Difficulties Questionnaire, decreased parental stress as measured by the Parenting Stress Index, increased parental satisfaction as measured by the Kansas Parenting Scale, as well as significant improvements in parent-defined problems and goals. The study has been submitted as a PhD thesis in University of Limerick (Nitsch, 2011), and was published by Child and Adolescent Psychiatry and Mental Health (Nitsch, Hannon, Rickard, Houghton & Sharry, 2015). Decrease in conduct problems and total difficulties and an increase in prosocial behaviour as measured by Strengths and Difficulties Questionnaire. Decrease in Parental Stress as measured by Parent Stress Scale. Reduction in commands and increase in positive attends in the parent-child interaction as measured by independent before and after video observation. Significant reduction of parent-defined problems and gains in parent-defined goals. Compared to those in the ‘treatment as usual’ group, parents in the PPEY group reported more significant reductions in their children’s behavioural problems post-intervention. There was no significant difference in benefit for children with developmental delay and children with behaviour problems primarily, suggesting that the PPEY programme is equally beneficial to both groups. Furthermore, positive gains were maintained at five month follow-up. The study has been been published by the International Journal of Clinical and Health Psychology (Griffin, Guerin, Sharry & Drumm, 2010) and the pilot study was published by Clinical Child Psychology and Psychiatry (Sharry, Guerin, Griffin & Drumm, 2005). A pre and post community study of the PPEY programme delivered in highly disadvantaged junior schools (Kilroy, Sharry, Flood & Guerin, 2011) showed that a significant number of the 40 parents enrolled in the programme reported high levels of behavioural and emotional problems in their children pre-intervention (23% in the clinical range) suggesting the high need for these supports. Most encouraging though was the high impact of the PPEY groups – only 3% of children whose parents completed the course were found to be in the clinical range post PPEY, lending support for parenting groups in the community. The PPEY Community Course was delivered as part of a suite of interventions to preschool childcare services in disadvantaged areas over several years. The programme was independently delivered and independently evaluated as part of a clustered randomised control trial (RCT). Significant positive effects were observed within the home learning environment for parents who completed the PPEY. ‘In particular, this finding isolates the Parents Plus Community Course as being a key component in improving the home-learning environment, even two years after the course was attended’ (Hayes, Siraj-Blatchford, Keegan & Goulding, 2012, p. 39). As one of the 10 national projects supported by the the National Early Years Access Initiative, the Parents Plus Community Course was rolled out to over 700 families in 35 different childcare services in North Dublin over a two year period. The resultant study (Gerber, Sharry, Streek & McKenna, 2016) involving the 277 parents who completed the course found that there were significant reductions in child behavior problems and parental stress from pre- to post-intervention. Most significantly, the courses successfully engaged disadvantaged families with significant problems (40% of sample) and these families benefited most overall. The results demonstrate the unique attributes and potential that preschool PPEY programmes can offer as a cost-effective and sustainable resource for early intervention with young children and their families. The study was published in the European Early Childhood Education Research Journal in 2016 (Volume 24 Issue 5). A short qualitative study by Griffin, Sharry, Guerin and Drumm (2006) describes parents’ reports of the main benefits of the PPEY group at follow-up. Group support was identified as the main benefit.